Posted in: Public Outreach. Tagged: osiris rex. NASA’s OSIRIS-REx asteroid sample return mission launched on September 8th to visit asteroid Bennu, a carbon-rich, near-Earth asteroid. The spacecraft will rendezvous with the asteroid in 2018 and ultimately bring samples of Bennu back to Earth in 2023. Join the Boise State Physics Department on Oct 7 at 7:30p to celebrate the launch. The event will kick off at 7:30p in room 101 of the Multipurpose Classroom Building on Boise State’s campus, right across the street from the Brady Street Parking Garage. 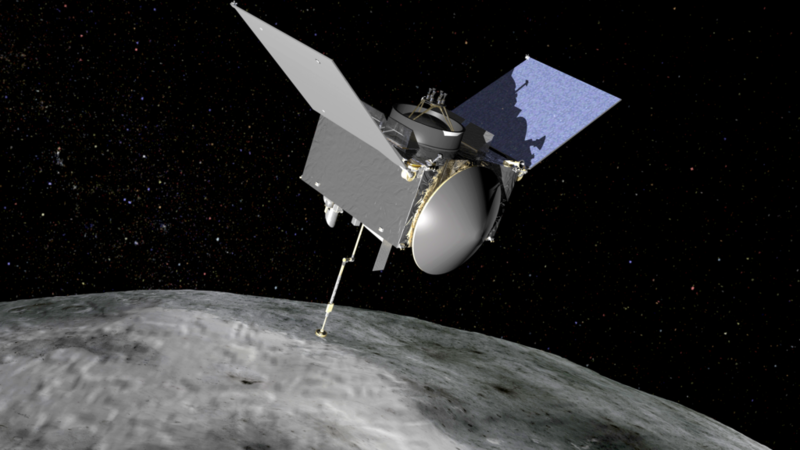 Alessondra Springmann, a planetary scientist at the University of Arizona, will give a public talk on the OSIRIS-REx Mission. At 8:30p, the event will move to the top of the Brady Garage, where telescopes will be set up for gazing at the Moon, Mars, and Saturn. 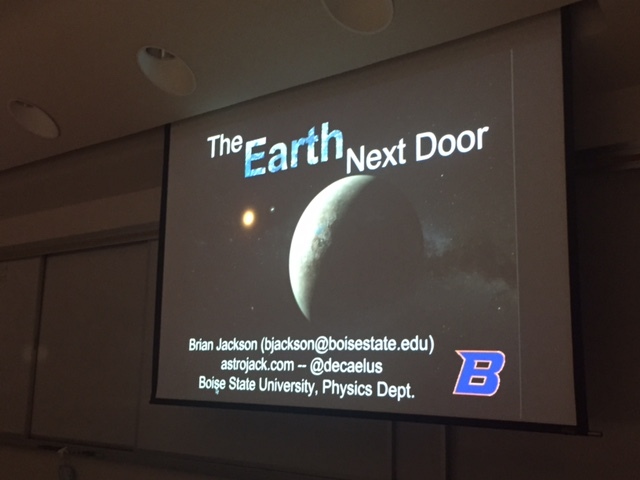 For more info, www.astrojack.com/bsu-orx-event/ or e-mail Prof. Brian Jackson (bjackson@boisestate.edu). 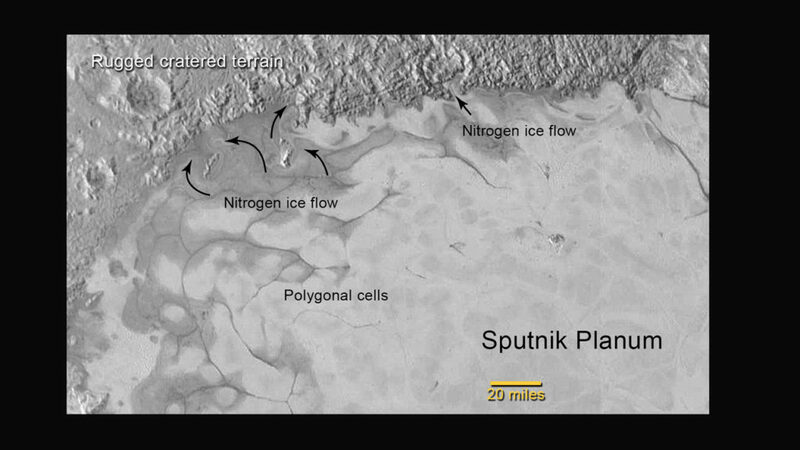 Proxima Centauri b: Extraterrestrial Oasis or Desiccated Mirage? Posted in: BSU Journal Club. Tagged: astrobiology, exoplanets, Proxima Centauri. Fig. 11 from Barnes et al. (2016) showing evolution of the HZ (blue region) of Proxima Centauri, along with the orbits of Proxima Centauri b (solid line) and Mercury (dashed line). 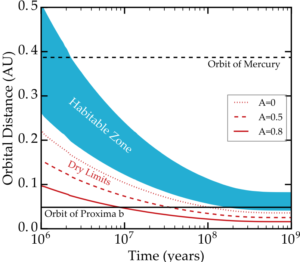 As a follow-up to last week’s Proxima Centauri b event, we discussed a recent analysis of the planet’s habitability by Prof. Rory Barnes and colleagues in our weekly journal club. In this paper, the authors consider a very wide range of evolutionary scenarios for Proxima b to explore the resulting range of outcomes and decide how habitable the planet is, really. They incorporate lots of potentially important effects, including the evolution of the host star’s luminosity and its influence on the planet’s surface temperature. M-dwarf stars, like Proxima Centauri, get dimmer early in their lifetimes. As a consequence, the surface temperature of a planet orbiting such a star can drop over time. Or, put another way, the habitable zone (HZ) around the star can move inward, meaning planets that start out interior to the HZ (i.e., planets that might be too hot to be habitable) may eventually enter the HZ. Figure 11 from Barnes et al. (2016) shows that this is probably what happened to Proxima b: it started out way too hot for habitability and, as its host star dimmed, it entered the HZ. As Barnes et al. show, such a history could potentially drive away all the planet’s water (assuming it started with any), leaving behind a dried husk of a planet. But the fact that the planet is CURRENTLY in the HZ could fool us into thinking it’s habitable. This result shows that planetary habitability is a complicated idea and that the current conditions on a planet can depend in a complex (and hard-to-determine) way on its history. Time (and lots more data) will tell whether Proxima b is actually an extraterrestrial oasis for life or a barren wasteland.